Consumers in Japan can now purchase a new lemon yoghurt flavoured soy milk drink, courtesy of Japanese beverage company Pokka Sapporo. 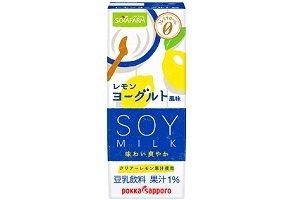 Released under the Soyafarm name, the new launch is said to have a refreshing flavour, making it ideal for the morning, according to Pokka Sapporo, citing research that found that more soy milk was drunk in the morning than at other times of day. According to information, Soyafarm Lemon Yoghurt Soy Drink is cholesterol-free and contains soy milk that is produced with a ‘clear method’ for a light taste, and clear non-bitter lemon juice that is ideal for blending with soy milk. Pokka Sapporo’s latest launch will be made available in 200ml cartons from 19th September 2016, with an RRP of ¥90 ($0.88).